Clemenger BBDO Melbourne, Host Sydney, JWT Melbourne, DDB Sydney and 303Lowe Sydney were among the Grand Prix winners at the SpikesAsia awards in a night dominated by Aussie agencies. Presented last night in Singapore, the program involved over 1800 delegates from 27 countries who took part in three days of presentation, networking events and the awards, in Asia’s answer to Cannes. The night belonged to DDB Sydney who picked up agency of the year and the print Grand Prix for ‘Bikers-Police’ for Volkswagen. BBDO was presented with the Network of the Year trophy with DDB coming second followed by Leo Burnett in third. The Independent Agency of the Year was awarded to PARTY, Tokyo with Taproot, Mumbai in second and The Monkeys, Sydney in third. The inaugural Spikes Palm award, given to the best Production Company, was taken by Exit Films, Melbourne. Revolver, Sydney came in second and Finch, Sydney third. The Media Agency of the Year trophy was awarded to Mindshare, Mumbai with Cheil Worldwide, Seoul taking second place and in third, Whybin\TBWA Group, Sydney. During the awards, the prestigious Advertiser of the Year accolade was presented to P&G Asia in honour of their commitment to engage their consumers by not only embracing but also expecting creativity in their product communications around Asia. Host, which was sorely disappointed to only win bronze at Cannes for its Kiwi Sceptics mini-series for Air New Zealand, won the branded content grand prix. 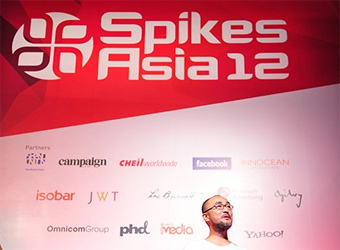 The full list of gold, silver and bronze winning entries can be viewed on SpikeAsia’s website.